I've been interested in seeing this movie since I first saw trailers for it since I really liked Taken. I don't think a lot time is supposed to have passed since the end of the first movie, but I'm not completely sure. Bryan has a much better relationship with Kim and even his ex Lenore. Lenore's second marriage is falling apart and Bryan is supportive to her. The two of them are definitely getting along better than they did in the first movie. Bryan seems to be more settled, though he still travels some for work. Kim and Lenore end up going to see him in Istanbul. Meanwhile, Murad, the father of one of the men from the first movie, decides that he is going to get justice for his son and the other men and sets out to track down Bryan. Of course he and his goons find Bryan in Istanbul and put their plan in motion once Lenore and Kim are there. The plot isn't that different from the first movie really, but that didn't bother me. I think it makes sense that Murad would want revenge - he called it justice, but it is really revenge. What is harder to buy is that Bryan, with all his training and his previous work history, didn't seem to consider that something like this could happen. Considering what he did to get Kim back before, it doesn't seem to fit that he wouldn't have used his connections to keep on eye on family members of the men to make sure that no one would try to come after him. He was taking some precautions in Istanbul, but not enough and at times, he had no concern at all for Kim's safety, something else that is out of place for him. At one one point, Kim, who has struggled to pass her driver's test, is the one driving during a high speed chase, something else that seems to stretch believability a bit. Those things didn't make me enjoy the movie less, but I do see them as issues. There are several action scenes throughout the movie, and unfortunately, the dreaded shaky camera work is front and center. I hate that. It's very annoying. Once again, Bryan uses his ..specific set of skills to deal with the situation. He has no problem beating the crap out of people or killing people to get things accomplished. Things do get violent at times, but nothing that graphic is shown since this movie ended up with a PG-13 rating instead of the R rating the first one got. The characters are fine, though none of them are that developed. Kim and Lenore are shown a bit more this time and have more to do. Lenore is more likable this time. Murad is the main villain and the one pulling all the strings. The other guys just seem to be hired goons, though some of them may be other family members. 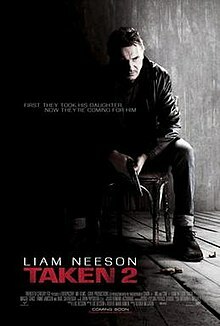 The movie does have some issues, but it is an entertaining action movie, though it isn't quite as good as the first one. I do think it is worth seeing. I did get a longer review posted at Epinions if anyone wants to take a look.